Let's look at public policies for economic development that help us recover from the recession. In one view of economic development, the role of government is to "make business succeed." In this view, government should get out of the way and let markets find the most efficient outcome. An alternative view of economic development is that government policies should raise our standard of living. In this view, government plays an active role in devising trade and industrial policies that attract investment, build industrial capacity, and create good jobs that build the middle class. And make business succeed. To be sure, markets are powerful and efficient, but markets fail. In particular, markets fail to serve non-economic interests -- not just the environment, human rights, labor rights, and public health, but markets also under-invest in R&D, education, physical infrastructure and social safety nets. 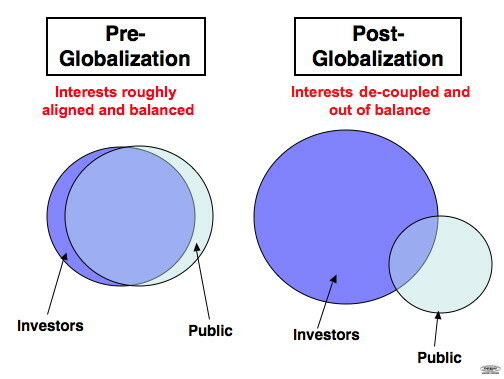 Globalization has sharpened the difference in these two approaches, by de-coupling investor and business interests from the public interest. If investors are global in their outlook, then the interests of America dim from view. In a global economy where national boundaries are blurred, we need to think about trade and industrial policies that work for America. A year ago, I mentioned 4 policies that would help reconnect the interests of investors with public interests and communities. Here are four more. Example 1 - Tax incentives. In Washington State, like many others, we have a baseline tax on business, with hundreds of exemptions for one industry or another, some stretching back into the mists of time. Suppose we bundled together all the existing incentives already in the tax code, and said, we would love to continue this $6 billion (let's say) bundle of tax incentives. Sadly, given the economic crisis, we simply cannot afford that level of business tax breaks, as if it were an open-ended entitlement with no accountability. Instead, we will cancel the exemptions, but set aside a $3 billion investment fund. We wish we could give you more! But we can't. Each business or each industry can apply for a share of this limited $3 billion public incentive fund. Any company's application should make clear what public good will be delivered from the tax incentives. The public good might be some number of high-school jobs, and a certain number of college jobs, so much new construction, or some strategic advantage in terms of market position. Competition for limited incentives can be open to any businesses willing to invest in the state. Successful applicants will report on progress toward meeting their voluntarily stated goals. If actual performance falls short, the difference will be recaptured and returned to the public investment fund. One variation on this could be a tax bonus system. Instead of applications, we would have a simple formula to determine public good. For each industry, the state tracks total employment, total payroll and total investment in the state. Instead of our current $6 billion open-ended incentives with no accountability and no measure of public good, a $3 billion (let's say) bonus pool could be allocated to those industries with employment growth rates above the overall average rate in the state. The bonuses could be proportionate to the rate of growth -- more growth qualifies for a bigger bonus. This would be a sort of pay-for-performance for companies seeking public incentives. Ideally, each year, the growth rate for different industries should be published, with great admiration for industries that produce more public good, and less admiration or none at all for those that diminish public good. Employers in every state and region plead for better-educated and more qualified workers. Instead, states are raising tuition. Families take a leap of faith that education is good and many graduates are crippled with student debt. Unemployment among recent college graduates is at historic highs. Why not insist on a minimal commitment from business at the transition from education to employment? As a quid pro quo, employers should commit to internships and increased employment for students enrolled in the programs. We should track the number of interns who are hired and complete 5 years of employment. If the transition from college to employment lags, then the industry should repay costs for the program. Peter Cappelli points out that it was common, years ago, for a business to provide on-the-job-training. Many still do. Employers who externalize training costs to the community are suggesting they don't have a commitment to workers or the community. Traditionally, an apprenticeship assumes an employment relationship. If a publicly subsidized apprenticeship is provided, we should insist that a local company hire the apprentices before they start the program. If the public subsidizes specialized training, and the employer lays off their apprentice employees within 5 years, the employer should reimburse the state for tuition. This makes much more sense than media accounts of laid-off workers paying $6000 out of their own pockets for a training program with no clear expectation of employment after graduation. The question should no longer be, "what can the state do to encourage business?" Instead, the conversation should be "public resources were invested in local industries. Which industries have returned public good from that investment?" Imagine launch aid similar to what Airbus gets in Europe. The government can hold the bonds, with the clear understanding that this public subsidy comes with an expectation of public good. If a company receiving launch aid suddenly decides to move work to low-wage countries, their launch aid loans could be subject to immediate repayment. The US encourages exports of domestically produced goods to foreign customers who need help with financing by providing loan guarantees and administrative assistance. The Export-Import Bank does this, with the condition that loans can be no more than the domestic content of the product. The more domestic content, the higher the loan amount can be. Furthermore, if domestic content falls below 85%, then the product is not eligible for the public subsidy. I am perfectly happy with making business succeed. We are Capitalists. Well, sort of. To be clear, however, in Capitalism, when a business needs capital, it goes to the capital market. Banks and lenders impose conditions on borrowers that protect the lenders. When a company comes to government, we should have conditions that encourage production to stick in our local economy. We should see a clear public good that raises the standard of living for workers and communities.